Florida Department of Agriculture and Consumer Services, Division of Plant Industry (FDACS-DPI) inspector Lisa Hassell collected the mealybug Phenacoccus multicerarii, a new continental record, from a retail nursery in Fernandina Beach (Nassau County, on 15 June 2011). On a return visit to the store, the mealybug was observed in high numbers on numerous host plants. On 28 June 2011, an additional find was made at a nursery in Apopka that had exchanged plant material with the nursery in Jacksonville. No further infestations were reported until October 2012, when a heavy infestation was discovered on a residential planting of Plectranthus scutellarioides (L.) Dodd (= Solenostemon scutellarioides, common coleus) in Cooper City (Broward County). This mealybug was described in 2007 from a sample collected in Caracas, Venezuela, in 1949 from an unknown host (Granara de Willink and Szumik 2007). Figure 1. Adult female Phenacoccus multicerarii on a leaf. Photograph by Ian C. Stocks, Florida Department of Agriculture and Consumer Services, Division of Plant Industry. Figure 2. Adult female Phenacoccus multicerarii on a leaf. Photograph by Ian C. Stocks, Florida Department of Agriculture and Consumer Services, Division of Plant Industry. This mealybug has been found in Venezuela and the United States (Florida). Phenacoccus multicerarii is a relatively large mealybug, with adult females oval in shape and measuring 3.5 to 4 mm (~0.15 in) long and 2 mm (0.08 in) wide. The general body color is yellowish to light gray with a conspicuous dusting of powdery white wax (Figures 1 and 2). 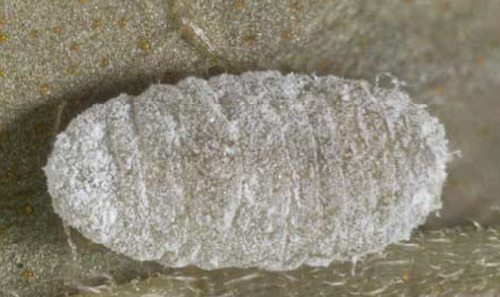 In the live specimens available for observation, the lateral and terminal wax filaments, which are commonly observed in many mealybug species, are only weakly developed or are absent. 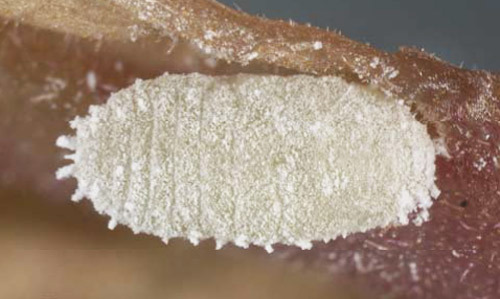 Adult females produce a large ovisac of cottony and sticky wax that is attached to the posterior of the female (Figure 3), and the eggs inside the ovisac are bright yellow. In general appearance and size, this species is similar to the common mealybug species Phenacoccus madeirensis Green, the madeira mealybug, and Phenacoccus solenopsis Tinsley, the solenopsis mealybug. Positive identification requires slide-mounting of the specimen. In the Apopka nursery infestation, both the madeira mealybug and Planococcus citri (Risso), the citrus mealybug, were also found. Figure 3. Adult female Phenacoccus multicerarii with ovisac on a leaf. Photograph by Ian C. Stocks, Florida Department of Agriculture and Consumer Services, Division of Plant Industry. The series of collections made at the Fernandina Beach nursery and the residential planting in Cooper City revealed a population with all life stages present. Numerous females had fully developed ovisacs filled with eggs, and both immature and adult males were found. Asteraceae: Pseudognaphalium obtusifolium (L.) Hilliard and Burtt, obtusifolium subsp. Convolvulaceae: Ipomoea batatas (L.) Lam. Liliaceae: Hosta sp. ; Aloe vera (L.) Burm. f.
The potential impact of this mealybug should it become established in the environs is unknown, but finding robust populations on several unrelated plant species suggests that it is potentially polyphagous. The genus Phenacoccus is very large and contains many species that are or have been highly destructive in various regions of the world. In general, all Phenacoccus species should be considered as high-risk for establishment. Granara de Willink MC, Szumik C. 2007. 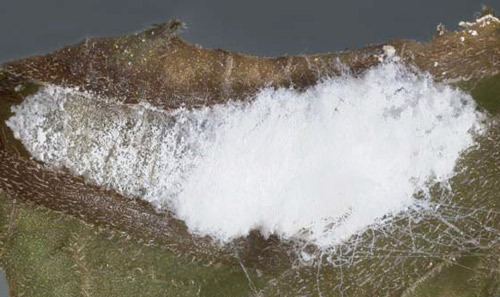 Phenacoccinae de Centro y Sudamérica (Hemiptera: Coccoidea: Pseudococcidae): Sistemática y Filogenia. Revista de la Sociedad Entomológica Argentina 66: 29-129. Publication Date: April 2013. Reviewed: February 2019.